By David Ponce on 12/22/16 • Leave a comment! Are you still into Steampunk, the retro-futuristic Victorian-era-inspired aesthetic that was all the rage a couple years ago? Well, have we ever got a light switch for you. It fits over most standard wall switches in the USA; just unscrew the plate cover and screw this one in instead. My lever system has a bolt and nut design that allows you to adjust the amount of torque needed to flip the lights on and off. Your purchase comes with a small, matching wrench to help you adjust the bolts. It also comes with a steel spacer plate that ensures a tight seal against the wall and also prevents wobbling and unsightly gaps. This design is compatible with toggle switches. 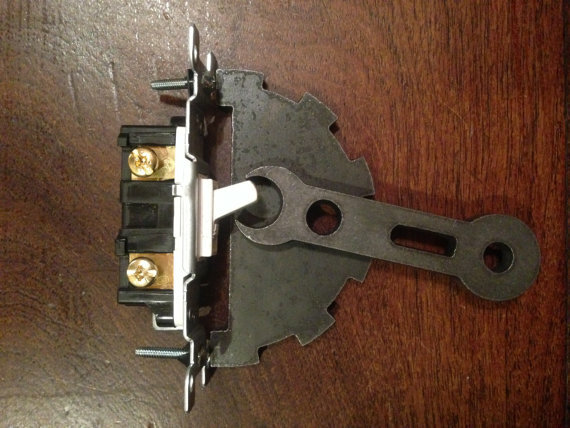 If you have a dimmer or rocker switch, I can include a 15A-120V toggle switch with your order at no extra charge. 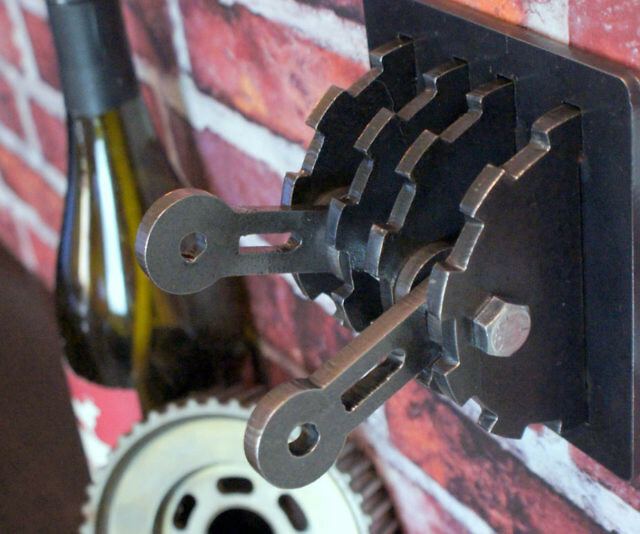 It’s actually made from plasma cut steel, which makes it look and feel more authentic. And by the way, if your home has more of an industrial feel (the grown up version of steampunk), it’ll work just as well there. It’s $65. By Hazel Chua on 10/18/13 • Leave a comment! If you’re a tourist in Japan, then you have to try riding their bullet trains at least once during your visit. They’re definitely fast, but some might argue that they don’t offer the most comfortable of seats on board. That might be true–until the Seven Stars train came along. 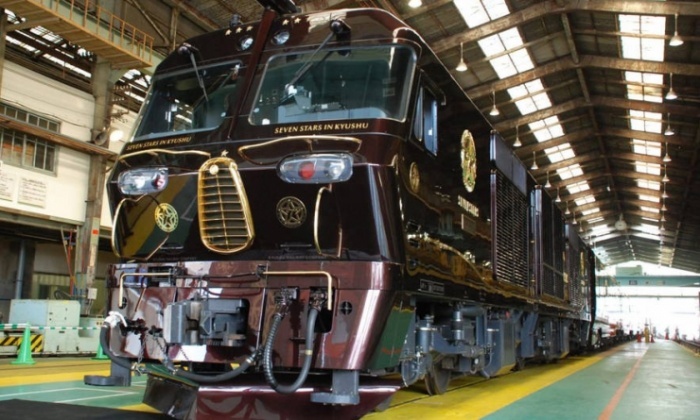 It’s a train that’s decked out in steampunk-style exteriors on the outside and luxurious comfort on the inside. For example, Deluxe Suite A features a spacious 226-square meter room and a five-foot panoramic window that offers a gorgeous view of Kyushu from the rear end of the train. Every one of the cabins is covered in intricate wood decorations and high paneled ceilings. What can you do with a pocket watch, except bring it out when you want to know what time it is? Why, take its insides out and create one of the awesomest steampunked versions of Iron Man’s arc reactor! That’s what Adi Simion did and it looks out he succeeded in creating a piece that Tony Stark himself would be proud to own. 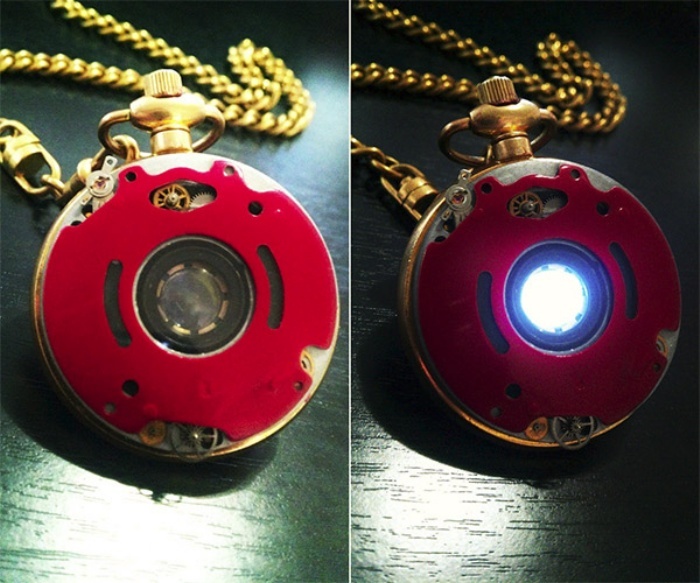 You won’t be able to read the time off of the pocket watch anymore, since its face has been taken out to make room for Iron Man’s reactor, but who needs a watch when you can have Iron Man’s source of power, right in your very own pocket? 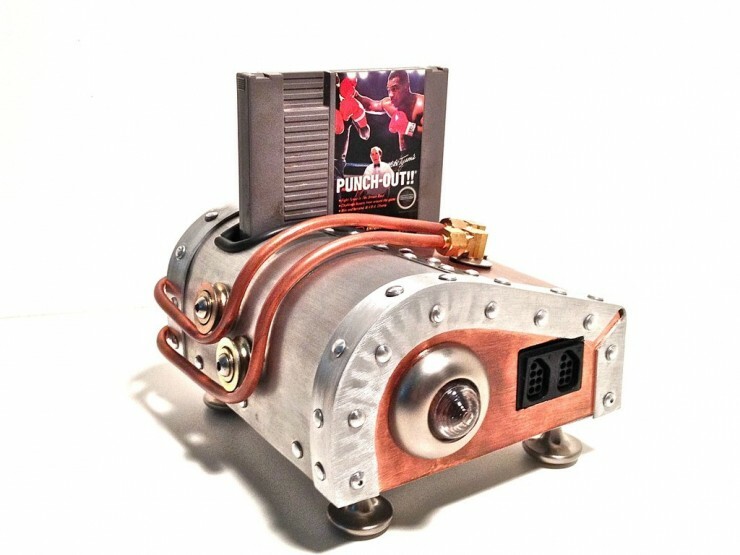 That’s a sweet looking NES case mod, ain’t it? Well, you can’t have it. It was lovingly hand-made by redditor Andrew5785 for his cousin. 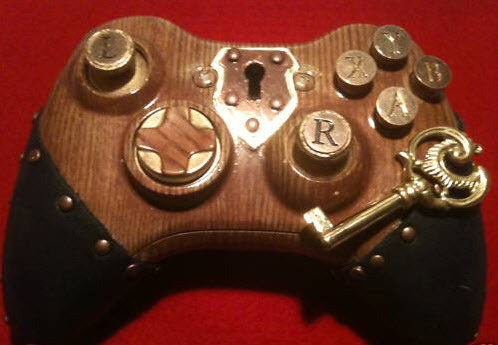 It’s a one of a kind, and no one at OhGizmo knows anyone crafty enough to make a replica. Should I try, the likelihood of severing a digit is a non-negligible figure. But we can all look at pictures and wonder what it’s like to have an uncle that makes stuff like this. These pictures, by the way, are after the break. Custom ABXY buttons for an authentic look and feel! Triggers and bumpers are wood finish as well!!! Of course the price is going to keep all but the most serious steampunk aficionados away, as the Buy It Now price is a cool $1,000. By Chris Scott Barr on 09/06/10 • Leave a comment! Mr. Potato Head has been around since the early 1950’s, entertaining millions of children with his interchangeable parts. 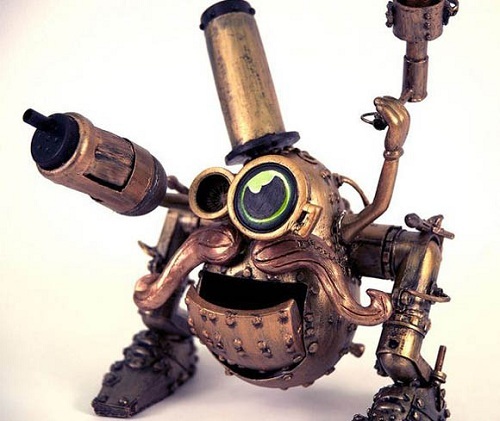 But what if he hadn’t been created in the 50’s, and instead in the alternate universe of the Steampunk world? One crafty artist spent some time thinking on this very topic, and ended up with Sir Spudnik. This bizarre specimen is a real Mr. Potato head base that has been covered in metallic and brass-like parts. Artist Sarita Maria felt the need to take things a couple of steps further by creating a mock wanted poster, and a very DaVinci-like blueprint for the toy. The best part is that she detailed the entire process over on her Instructables page. I’ve had more than my fill of the ‘steampunk’ trend, but I don’t feel guilty about posting yet another SP creation when it’s as impressive as this custom Optimus Prime figure. 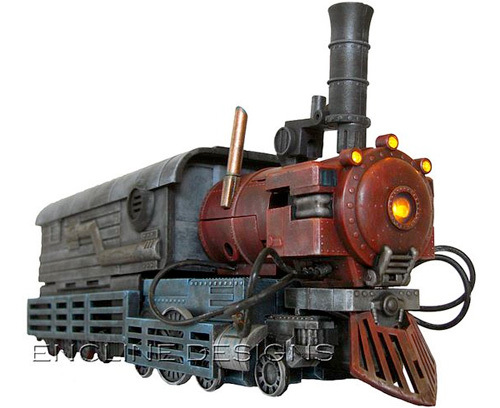 I guess if the Transformers had reached Earth before the time of the automobile they would have had to make do with the available transportation at the time, in this case, a steam locomotive. But, it doesn’t make Optimus look any less badass, that’s for sure. 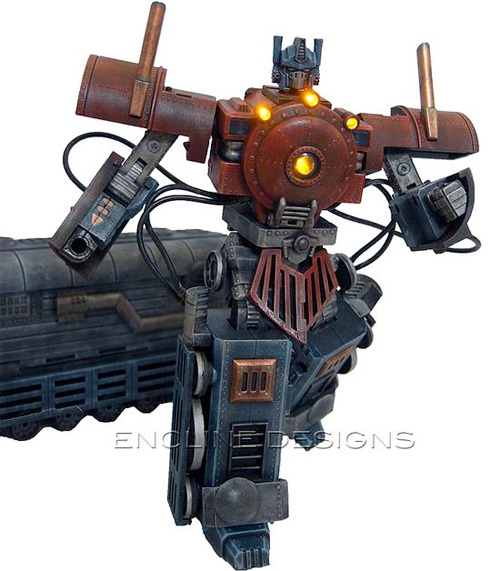 The figure was created by Encline Designs and is fully transformable from robot to locomotive form. There’s even his trademark disappearing trailer complete with an old-timey cannon inside, and thanks to a set of LEDs, the lamps and boiler on his chest all glow as if they were burning away. Now where’s the Megatron six-shooter to go with it? By Andrew Liszewski on 08/20/10 • Leave a comment! 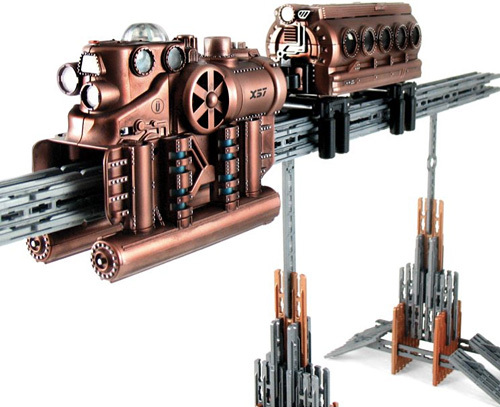 Dropping $160 on this steampunk or “Victorian Futurist’s” monorail building set is kind of a hard sell since you can get a decent stash of LEGO bricks for that much money. But I know there are those of you out there who refuse to let the steampunk fad die, going as far as to force your kids to wear aviator goggles and knickerbockers, or play with a toy like this. I’ll admit the monorail’s engine and car do look the part, and the 550 piece set includes a track that “can run as long as 20 looping feet.” Alas all those miniature valves and pipes are just for show though, since this thing runs on a set of 4 decidedly unsteampunkish AA batteries. $159.95 from Hammacher Schlemmer. By Chris Scott Barr on 07/14/10 • Leave a comment! For all the sleek beauty that the iPhone has, in some ways it still doesn’t compare to the elegance of some of the older-style corded telephones. 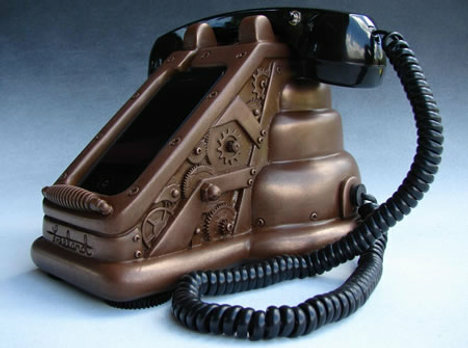 One Etsy user realized this, and decided not only to make a retro dock for their iPhone, but to Steampunk it as well. Each awesome dock is hand-sculpted and hand-cast in urethane resin, which produces a stylish, yet functional base for your phone. The USB cable is routed through the base, hidden from view. The handset itself is completely functional for making calls with your phone. The only thing stopping me from buying one is the $450 price tag.